Welcome to Aragorn_Lims, a Last Icon Maker Standing icon competition. Every challenge you'll enter an icon using a cap supplied of the amazing Lord of the Rings character, Aragorn. Each time voting goes up, you vote for your least favorite icon(s), and a number of people will be eliminated until we achieve a Last Icon Maker Standing. You must first sign up in order to participate. The sign-up post is located here. • Join and friend the community. People who are not joined can not enter. • Once you're a member, head on over to the sign up post, and comment! • Put "You have my sword." in your comment somewhere so we know you've read the rules. • Signing up ends on Friday 25th April, so make sure you've done so by then! 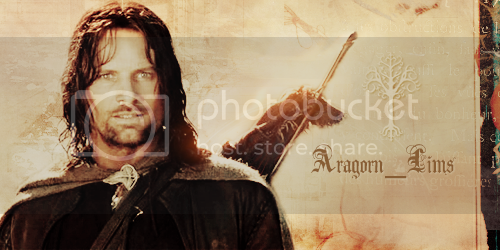 • When a new challenge is be posted, you'll be supplied with a screencap of Aragorn. • You have to make an icon out of the caps supplied. • Textures, brushes, and gradients etc. are all perfectly valid. • Animation and non-animation is also valid. • Your icon must fit livejournal standards (under 40kb, 100x100 px, and in .jpg, .png, or .gif format). • Once you have made your icon, comment to the challenge post with the img src and url. • Your icon must remain anonymous until the winners have been posted. This means you can not use or post it anywhere else online. • You do not have to be a participant or member of the community to vote. • Anonymous votes WILL NOT be counted. • Do not vote for yourself or get anyone else to. • You will comment and vote for your least favorite icons (you will be instructed as to how many to vote for), giving reasons for each vote you give. You may vote even if you have been eliminated. • If your icon does not make it through you'll be eliminated from the LIMS, and can not enter any of the next challenges. * You will automatically be given one free skip, which means that you may not enter one of the challenges and still remain in the running. Find out how to earn more skips here!